Because siding covers most of your home’s exterior, there’s a good chance you want to make the best and most fitting choice. When you first see a home, you’ll likely notice the yard (if there is one) and the exterior. Osborne Painting’s team has worked closely together for many years, consistently ensuring The Osborne Difference is apparent in every customer relationship. Often times, industry experts claim that a home not only provides you shelter but is a reflection of your persona as well. Whether you’re preparing your home for the housing market and want to increase its overall value, or simply want to enrich the look of it, these popular options may be worth considering. In this article, we will touch on each popular siding options and the pros and cons associated with each option. Generally easily maintained and versatile, wood siding has been a popular favorite amongst homeowners and designers over the last decade or so, and for good reason; it can look ravishing, welcoming, and unique if fulfilled properly. Along with easy maintenance and versatility, wood siding can also be customized extensively; there are dozens of staining techniques and shades as well as clear coat alternatives in case you want to avoid using a solid paint color. The downside to wood siding would be its susceptibility to warping, rotting, or cracking, as well as the time is taken to treat the wood to endure general weather elements. Many homeowners express having interest in painted wood siding for their house, that is until they understand more about the preparation process for painted wood siding. On top of painting the siding, the homeowner will also need to deal with the treatment of the wood before the actual painting takes place. 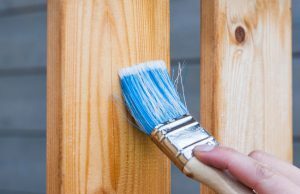 Preparing wood to be painting isn’t necessarily an easy feat as some may assume, as, depending on the wood, could double or even triple the start-to-finish labor hours, resulting in a higher project bill than initially anticipated. More often than not, preparing wood siding for paint entails extensive coats of stain and weather-resistant products on top of the actual primer and paint itself. If you decide to go with painted wood siding, remaining as vigilant as possible will help you maintain an accurate grasp of the cost of those additional and inevitable labor hours. Rather than maintaining a home’s paint, many homeowners opt for a simpler, more straightforward alternative: vinyl siding. Generally speaking, trailers and one-story homes are equipped with vinyl siding. Durable and cost-effective, vinyl siding eliminates one major step in a home’s exterior construction; applying paint. Eliminating the aforementioned step of the project will result in lower labor costs, which could be a deciding factor if you’re on a tight budget. 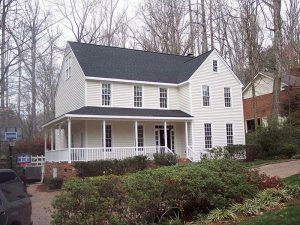 Offered in dozens of colors (any color you can think of, really), homeowners who opt for vinyl siding are able to decide on a color of the siding, install it, and move onto another project, as opposed to applying coats of paint that will likely need maintained and touched up in the next few years. Because not all vinyl is created with the same quality, it’s imperative to study up on quality of the vinyl you’re considering. Made from PVC (polyvinyl chloride), vinyl is built to resist fading and ultraviolet radiation, resulting in increased durability. If you live in a historic or contemporary neighborhood, installing vinyl siding may actually decrease the value of your home. Vinyl does require maintenance, but not nearly as much as wood, brick, and stone siding. If you’re looking for a low maintenance, cost-effective, and efficient exterior siding choice, vinyl siding may be your best bet. Fired clay, also known as brick, has been used as the exterior of homes for centuries. Made up of clay, cement, and gravel, it is safe to say that brick siding has proven trustworthy since its inception. Lasting approximately 100 years on average, the durability of brick siding is well known and often referred to as the conventional masonry material for construction. One huge advantage of using brick in the construction of a home would be the form and support it provides to the frame. Using brick as the primary siding material is, as you would think, the most supportive, but other alternatives, such as thin brick or brick veneer siding. Just 1/2′ to 1′ thick, brick veneer siding is popular with homeowners who have do not need to use brick as their primary source of structural support but still want that traditional, classic look. Typically, each panel consists of numerous rows of veneer bricks mounted on a fiberglass mesh backing. If you want to improve the overall look and feel of your house, or planning to sell your home and would like to increase the value of it, making the switch to brick siding may be your best bet. On average, brick siding costs anywhere from $10.00 to $18.00 per square feet, which is one of the most expensive alternatives. Is the switch to brick siding worth it? That may be a question for you to ask your realtor or other homeowners who have experienced success after making the switch. Consisting of water, wood pulp, fly ash, and Portland cement, fiber cement siding is said to combine the performance of masonry with the welcoming and delightful look of stone, brick, or stained wood for a fraction of the cost. An estimated 20 percent of modern homes are built with this stuff, which is an astronomically high percentage considering the many options homeowners have to choose from. Trimming down costs, especially in this day and age, is something the majority of architects and homeowners stride towards. If costs can be trimmed down without compromising the aesthetics of the home, you could imagine why fiber cement siding is the go-to for many homeowners and industry professionals. Because it must be painted or stained, fiber cement siding is one of the easier siding options to install, but not as easy as traditional, run-of-the-mill vinyl siding. If you’re considering fiber cement siding options, be sure to contact a trusted exterior painter to understand what they offer as far as the number of coats of paints, warranties available, or other project-related costs. There are two main options when choosing stone as a siding material: artificial and natural. As you could guess, authentic stone siding can be 10, 20, or even 30 times more expensive than artificial stone siding. From an outsider looking in, the two options are almost exactly the same and offer nearly identical benefits. Commonly referred to as faux stone, cast stone, or MSV (manufactured stone veneer) artificial stone consists of concrete while utilizing numerous pigments to achieve its color. Colors can range from red, blue, tan, grey, black, white, and even pink, so deciding on a color may be one of the most difficult decisions you’ll have to make throughout your entire project. Molds are often used to shape the artificial stone pieces into shapes the architect and/or homeowner can work with. Artificial stones are almost always the least expensive option to ship and are easier to install when compared to a natural stone siding. Natural stone, on the other hand, is a favorite amongst homeowners who yearn for the most classic, at-home feel money can buy. Prices are generally 15-30 percent higher than artificial stone siding, which could be worth the investment depending on the goals and plans you have with your home; If you plan to update our home in preparation to put it on the market for sale, stone, either artificial or natural, may be an option to consider, as it’s been known to increase the overall value of homes by 10, 20, even 30 percent or more. If this is your plan, consider talking to an industry expert who may be able to provide insight from experience. Offering numerous benefits, such as being fire and insect resistant, stone siding is definitely a considerable option. Yes, stone is one of the most expensive siding options for your home, but depending on your circumstances, it may be well worth looking into. In conclusion, there are many factors associated with choosing the right exterior siding option for your home. By gaining a solid understanding of what you’re looking for, what your needs are, and what your goals are, you can narrow your choices down to only a few. 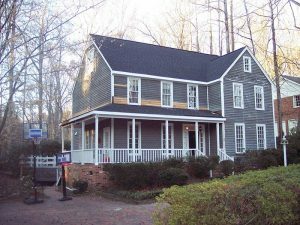 When you choose Osborne Painting as your Raleigh exterior painter, we guarantee you’ll receive the best service possible — we like to refer to it as “The Osborne Painting Difference”. Please contact us today for your free estimate by giving us a call at 919-878-6611 or filling out our easy-to-use contact form.